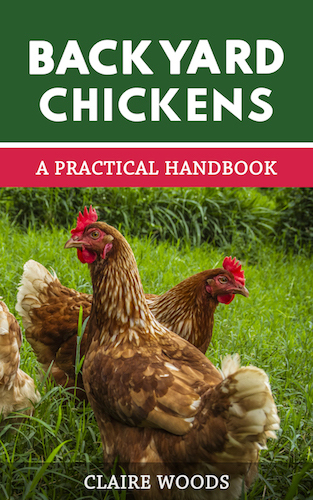 What Is A Chicken Brooder? 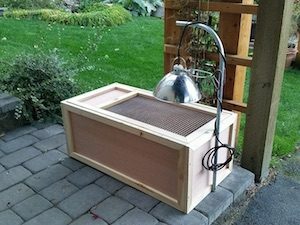 Some folks get confused thinking a chicken brooder is an incubator of sorts. Well, the unhelpful answer is – it can be! An incubator is the place where you put fertilized eggs to be hatched. In this closed environment the egg is supplied with heat and moisture sufficient to promote growth and hatching. On day 21 your little peeps will emerge looking quite pathetic. At this point you should leave them in the incubator to dry off and fluff up. Chicks can actually stay there for 48 hours before they have to move. 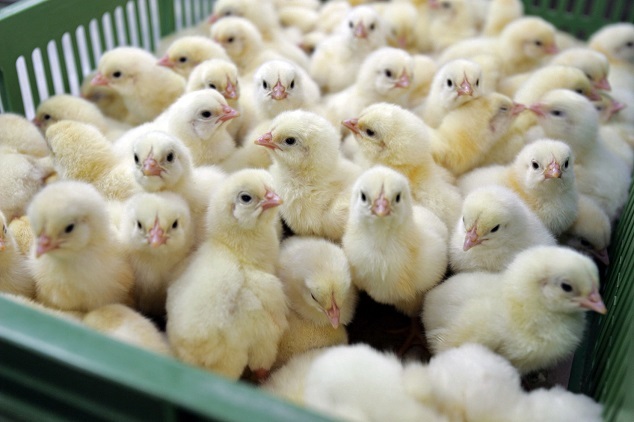 A brooder is the place where you move your chicks to after incubation. Here they will spend a lot of time being fed, watered, loved on and of course, being kept safe and warm. As you can see, the incubator was a brooder for maybe a couple of days, but it is not ideal for long term brooding. This is a step up from the box. Your chicks have now got much bigger and require more space so you have moved them to an area or a coop. Ideally, you would have the area brooder setup permanently so the chicks can stay there from until they graduate to the coop. If you intend to keep and raise chickens it’s always a good idea to have a brooding area/starter coop ready to go. When not in use you can use it for storage of accessories. Remember as a general rule the more expensive they are, the more durable they are. This is what most of us have or start out with; a large container that is modified or made to keep chicks in one particular space. This type is great when they are small and don’t require too much space. It’s usual to move them from the beginner brooder to a larger area with the same type of set-up. Whatever you buy or make, ensure it is at least 12 inches tall to prevent escape. Also it is difficult for chicks to grip with their feet, so until their legs are much stronger, use paper towels as flooring/bedding. They should be able to be changed over to pine shavings after 7-10 days. 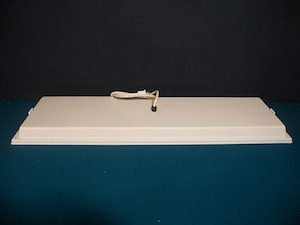 There are a few types of heater for brooding purposes, but the most popular is the heating plate. It is by far the easiest and safest to use. All you do is set it in the area, introduce the chicks to it (making sure the plate barely touches their fluff/feathers) and that’s it. Another huge advantage with these is there is minimal fire risk. The plate maintains an even temperature and the chicks have the freedom to move away or snuggle under at will. Brooder plates come in several sizes so you can brood 5-50 chicks with no problems. A heat lamp, or ceramic lamp, used to be very popular before the creation of the heating plate. 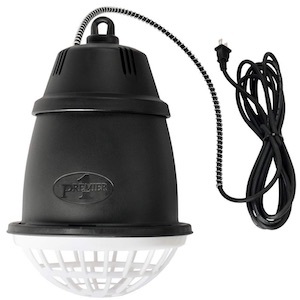 Simply hang the lamp on a chain and a secondary securing method inside the brooder. You then use a thermometer and adjust the height of the lamp to control the temperature for the chicks. It’s worth noting that heat lamps pose a significant fire risk, make sure yours is securely fixed in place and is working correctly before you start brooding. 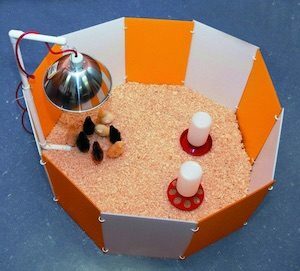 Infrared heaters are similar to heating lamps, however the lamps are said to reduce aggression in chicks so they are usually recommended. As they are a large panel they do a great job of spreading the heat around the brooder so you don’t get chicks bullying each other for space. They are also thermostatically controlled, which makes them more cost effective and more efficient. Whilst a little more expensive if you are anticipating long term use, the cost is well worth it. Regardless of the type you buy, just remember at its most basic, it is a safe, secure area that houses your chicks until they are large enough to move into the coop. Perimeter: Can be bought or made. Security: It needs to keep out cats, dogs, mice and small children. The area should be completely self-contained and accessible by only you. Water: Again, you will need to provide a suitable drinker and clean, fresh water daily. Bedding: Suitable for chicks. This can be newspaper or paper towels for the first few days, then transition over to pine shavings. Chicks are tiny and always huddle together, but don’t let that fool you they still require a fair amount of room. The recommended square footage is 2 per chick! In the first couple of weeks you can get away with a bit less, but once they start to grow and try to find their place in the pecking order, mischief will break out. Toe picking, feather plucking are two manifestations of nasty habits and once these start it is difficult to break them. 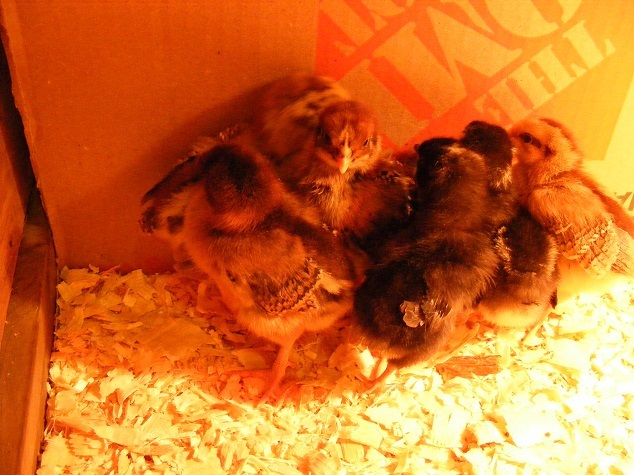 At 6-8 weeks old, the floor space needs to be increased to 4 square foot per chick. You are approaching adult dimensions for bird space. Adolescence is the worst time for bad behavior, so plenty of room is advisable to prevent injury, bullying and frustration. Which Brooder Should I Buy? 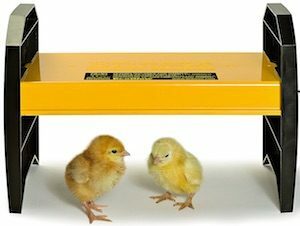 So what type of brooder should you buy? The answer will depend on what you intend to do after this batch of chicks and of course, finances. If you fully intend to hatch several batches of chicks then it really does make sense to buy a kit. Make sure it has all you need and is very durable. If you don’t want all of the components then buy what you do need. If on the other hand, you have a designated space ready and some supplies ready – simply buy what you need. Before you introduce your chicks to the brooder, a couple of things need to be done. Even if you bought all the equipment brand new, rinse it down with either some disinfectant or warm, soapy water to make sure it is clean. Secondly and most importantly, test everything to make sure it works and have it working before you place the chicks in it. 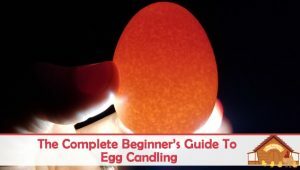 What Brooder Temperature Do Chicks Need? We had briefly mentioned temperature earlier, but for the sake of completeness, we will run through it again here. Remember during each temperature drop to observe your chicks and make sure they are comfortable. The best way to determine if it’s warm enough without a thermometer is to watch your chicks. If they are at the outer reaches of the box – it’s too hot; if they are clustered under the lamp – it’s too cold; if they are dotted around the area you have it just right! At around day 28 chicks can go outside for short spells as long as it is warm and sunny. Also if you are hatching in winter you can drop the temperature by another 5 degrees to 65°F until they are fully feathered out. Brooding your own chicks is always a fun and interesting time. It’s a good way to teach kids about chicks and the care they need too, it is a lesson in life and caring. 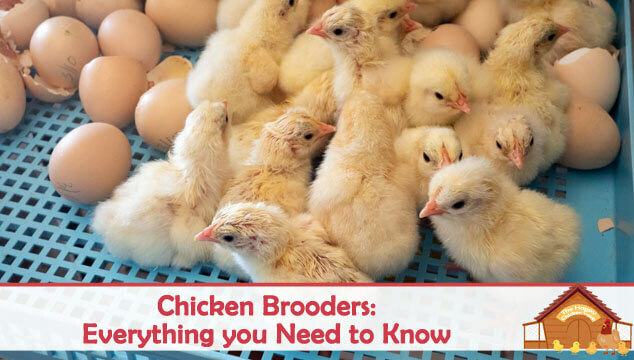 We hope this has been beneficial to you in buying brooders and assessing what you need. My best advice is if you are thinking of hatching chicks next year, start buying stuff this year. In fact, why not ask people to get you something you want for Christmas! do chicks need heat lamp night AND day in summer time? won’t they get too hot in the day light hours? They do not, if you have cold drops depending on your zone, a heat source at night for chicks is appropriate. During the day I never provide a heat source after 4 weeks of age. If its 55-60 degrees F, I do not provide anything. I would just like to say in the chicken brooder picture, the chickens are cold! They are huddling under the heat source. Did you have anything to do with this picture? 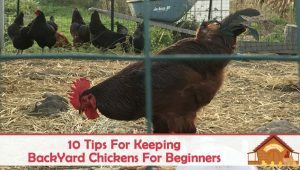 (Not trying to hate, I’m a first-time chicken owner but I’ve done my research!) Great article by the way!